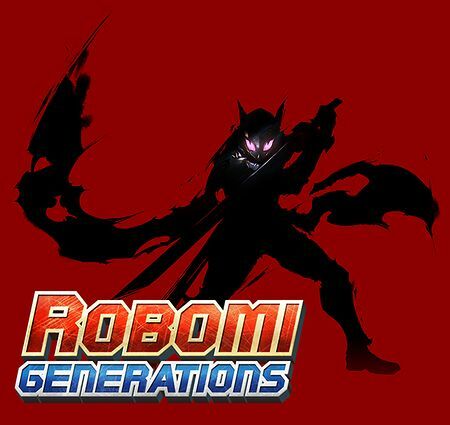 Robomi: Generations is a story event. It is the sequel to Robomi. This event premiered concurrently with a rerun of Robomi. The rerun of Robomi: Generations is a stand-alone event. 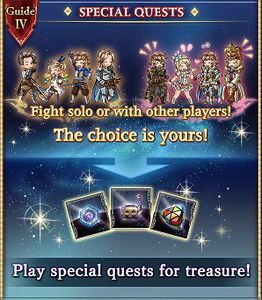 This event is part two of the Robomi saga. Part one is Robomi. Part three is Robomi Z.
leaped across the ages to help those in need. brought smiles to faces of the desperate. And her love inspired one man. to battle for what mattered most. 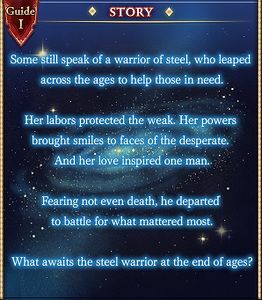 What awaits the steel warrior at the end of ages? Gigante Launcher is somewhat notable as, despite being a standard event-stats primal ATK up weapon, it is one of the few SSR guns available to Dark that isn't crafted, and is the easiest to obtain while the event is running. 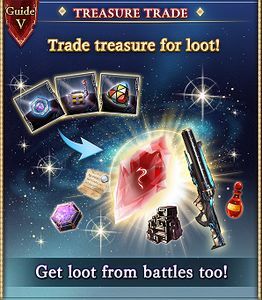 If you do not have a Cerberus Order, and you do not want to farm a Phantasmas or Abyss Gaze (or don't have the rank to do so), it is worthwhile to obtain a 3★ copy of this gun from the event so that you have a dark mainhand for Gunslinger and Mechanic. 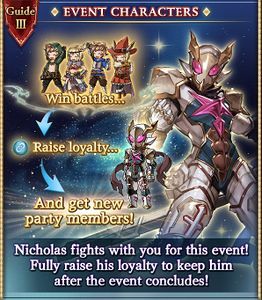 Nicholas (Event) joins you after earning 750 loyalty. Casts Supersonic or Electromagnetic Bolt. 4-hit Dark damage to random allies. Casts Flames of the Abyss. Multi-hit static Wind damage to random allies. Multi-hit static Earth damage to random allies. Duration: 60 seconds and removes 1 debuff on self. Abominations! A threat to all humanity from the far past. When their roar is heard, the first act of the tragedy begins. Wailing, not knowing what to do, the people panic and flee. Hearing voices crying for help, justice appears at last. Who went to battle, her chest filled with the resolve to never again return. The legend of the warriors of steel. Have you seen the tears flowing at the end of ages? 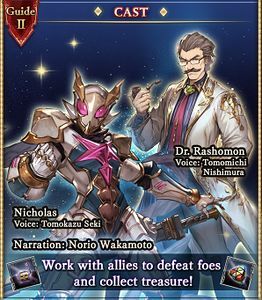 Norio Wakamoto narrates the voiced trailer, but he does not actually voice any characters in the event. This page was last modified on 10 June 2018, at 23:30.